Today rounds up a week in Alaska, preceded by a couple of days in Seattle. This was a very significant and enjoyable trip. First, Christine matched at Cottage Hospital in Santa Barbara for next year and then Stanford for the duration of her medical training. This is a great achievement and it also means that we will be living in the same state and even the same place for the foreseeable future. So, the trip to Seattle, where we found all of this out was just amazing. Well that and we got a great deal on a room at the Renaissance downtown! In Alaska we took the AK state fairy down to Kodiak directly after our arrival, well there was a 8 hour drive in there. The fairy ride occured over night and it was a bit bumpy, but there really is something magical about riding the fairy and our time in Kodiak was splendid. We saw the Kodiak brewery, the Native museum (they open special for us) and generally enjoyed walking around a small AK town where we could imagine living! From here it was back north to Alyeska ski resort. There we continued to learn how to ski, this was the second outing afterall, and generally enjoyed entire and staring out of the window looking at the big mountains. It was really relaxing and just what we both needed. I did managage to make it to the top of the mountain and ski the entire thing. This was my personal big accomplishment for the week (a simple and honorable goal I thought). It was a real thrill. Only in Alaska do they provide a flashlight (charged!) with the bible. And yes they still have phones in the bathroom. Everyone in the state (1/3 the size of the continental US) has the 907 areacode. Big comfy chairs for sitting entire days in. Then we returned to Anchorage in order to move Christine into UAA student housing for her two final rotations. There she moved into MAC 503. This is two stories lower than the unit where we were living two years ago when this blog began and where we spent a great stint in Anchorage. I must admit that the town has grown on me. It was really odd to be back in the same place, a place that I never really expected to return to. To be there and to be in such a different frame of mind. Before I had no idea where I was going to school, what future held for both of us... Now Christine has matched I am in the middle of my PhD and loving it. Oh... we went to the Organic Oasis yesterday for my birthday meal, the same as we had two years ago. (Christine hates to miss B-days, I think it is the cake, but I may be off). Happy Birthday me, early and all. So... here I am in Denver on a layover at the Fat Tire cafe. To bad it is 6AM and I was on an overnight flight! I just can't have a beer. (Silly voices in my head, they have such strict rules). There is a great diorama though, that points out one should "Live today like there is no tomorrow"
Well tomorrow begins the last quarter of the second year. This quarter will have 5 : a concert, Primavera (where I found myself on the website, a conference in Phili and the premiere of my trombone piece written for Mark Broschinsky. This is gonna be big fun! There is so much that I have left out, so I suppose I will have to backfill as time goes on. Last Saturday 3.8.08 and was quite fabulous. All of the performances come off really well even though the theme of the evening that emerged was failing software! Three of the five performances encountered this problem, but the saves were rather elegant. Monday, 3.10.08, James Orsher organized a concert and I performed a component of a composition by Cat Lamb. This was the first time that I performed on violin in ten years! And I must say, it was worth the wait this was a really great piece. 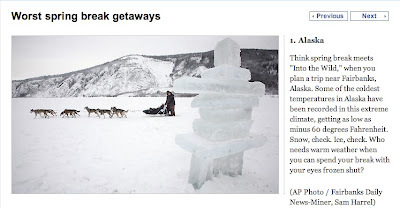 According to boston.com I am going on the #1 worst Spring Break Location!